Injuries caused to the Achilles tendon are associated with Achilles tendon pain and swelling. If case of an Achilles tendon rupture, care must be taken so as not to aggravate the extent of the damage to the tendon. If the immediate pain is manageable, the first two to three days can prove very vital to make sure that the pain or the injury does not alleviate. Although there are many Achilles tendonitis treatment options, as is the case with most injuries, immediate care is much better than having to undergo unnecessary and dangerous surgeries. In case of Achilles tendon ruptures, the best time of immediate care that can be provided should be done according to the R.I.C.E principle. R.I.C.E stands for Rest, Ice, Compression and Elevation. It is best for injuries to the joints, muscle pulls, ligament sprains and injuries to soft tissues in the body as there is a lot of immediate pain in these injuries. Rest: Pain in the injured area is the body signaling you to limit the motion of that injured part. The first thing to do is to make sure that the Achilles tendon and the foot area are given complete rest with little or no motion. The more the stressed muscle is stretched, the further is the damage caused. 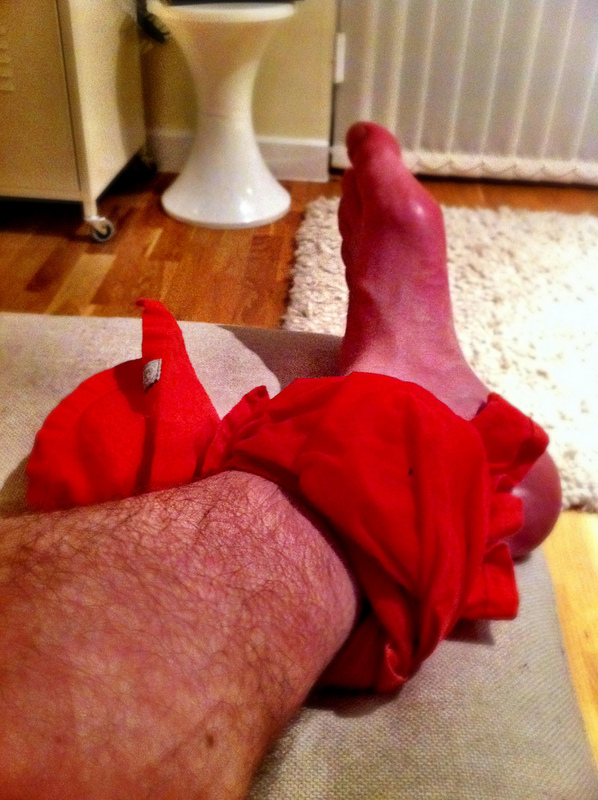 Ice: Ice packs or blocks of ice covered in towel or a piece of cloth should be administered next. The pack of ice should cover the entire extent of the injury, this helps in reducing swelling. There are coolant packs which are also available in the market and it is definitely a good first aid item to purchase. This protects the skin from frosting. Compression: The ice pack should be completely covering the injured part which should be further compressed by a bandage to help decrease swelling. Make sure that the blood supply is not cut off. There should be absolutely no tingling sensation or pain brought on by the compression. Elevation: Ensure that the leg is raised up on a cushion so that the injured body part’s level should be above the heart level. This reduces the supply of blood to the injured part but not cutting it off completely. Ice packs should be used for about 15-20 minutes. The ice helps reduce the pain and the injured part becomes numb in about 10 to 20 minutes. The Ice pack should be discontinued after half hour as it can result in permanent tissue damage. The R.I.C.E treatment is to be carried out every 4-5 hours for the first 2-3 days after the injury. If there is still pain or swelling or inflammation, then it could be because of internal bleeding or broken bones. It is best to consult with a doctor in such cases. This entry was posted in Achilles Tendon Rupture and tagged achilles tendon injury, achilles tendon pain, achilles tendon sprain, Immediate Care for Achilles Tendon Pain by Zipheal Editorial Staff. Bookmark the permalink.